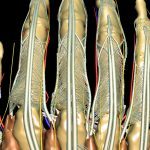 Voxel-Man 3D-Navigator: Upper Limb (2008) — interactive anatomy atlas of the hand, arm and shoulder. Voxel-Man 3D-Navigator: Inner Organs (2000/2003) — interactive anatomy atlas of the inner organs. 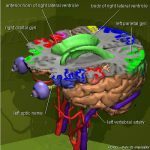 Voxel-Man 3D-Navigator: Brain and Skull (1998/2001/2009) — interactive anatomy atlas of the brain and skull. Other applications of this technology include the the multimedia training system EUS meets Voxel-Man, the Visible Dog and the Virtual Mummy. 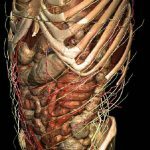 Until well into the 2000s, interactive visualization of medical 3D models was only possible on high end workstations. This applied in particular to high resolution voxel models, such as those derived from the Visible Human. To overcome these limitations, a new paradigm based on pre-calculated interactive scenes of the model was developed. As the base technology, the QuickTime VR format was chosen. In comparison to a linear film, a two-dimensional matrix of images is available, so that the scene can be created and explored with two degrees of freedom. As an essential innovation, it was extended by a pixelwise link to an anatomical knowledge base, which can be queried in the image context by simply clicking on it. A user can explore a scene largely with the functionality of a full visualization system, but in real time and without its complexity on any standard PC. Some 3D-Navigators are available for free download under a Creative Commons License. Rainer Schubert, Bernhard Pflesser, Andreas Pommert, Kay Priesmeyer, Martin Riemer, Thomas Schiemann, Ulf Tiede, Paul Steiner, Karl Heinz Höhne: Interactive volume visualization using “intelligent movies”. Studies in Health Technology and Informatics 62, 1999, 321-327.